After shooting a fellow police officer, CW McCoy surrenders her gun, her badge, and her confidence. Moving to Southwest Florida to care for her ailing grandfather, CW swears off violence until a fugitive kidnaps her family, and she is forced to decide which side of the law she is on. Set in the Tony Beach town of Spanish Point during the height of the tourist rush, Peak Season marks the debut of an investigator confronting the most dangerous enemy of all...her own fears. Really a good read with lots of character details and plot twists. CW McCoy....Widmer's created a great protagonist with many facets...hope to hear more of her! And the details of south Florida lifestyle and tourist season are spot on. Fast-paced and unexpected twists-along with several promising male figures- make this lots of fun. Yes, she gets better and better and really makes each character an individual. Smooth voice is pleasant to listen to. Made me want to hear more of CW's adventures! Are there any follow-on books? Amazing that a make writer can do such a great job with a female character as the lead! Easy to listen to, not much to it, great for listening to while driving. Worth a try, narrator makes it. "I was provided this audiobook at no charge by the author, publisher and/or narrator in exchange for an unbiased review via AudiobookBlast dot com"
If you could sum up Peak Season in three words, what would they be? Just enjoyed it and seemed like there would be a sequel since there were a few ends left hanging. Great setting. And a good read for guys, too, even though the main voice is a woman. Comes across in the audiobook as tough but still a woman. Yes. It has some really good characters and settings and the narration is just great. I really liked CW McCoy and although the plot was a little crazy, it moved fast and was just a lot of fun to listen to. It was kinda crazy and a tiny bit predictable but still a good summer listening book. I'll listen to the others if I can find them. Which character – as performed by Pamela Almand – was your favorite? CW, for sure. I can't wait to hear more of her Florida adventrues. What happened to CW? I can't find the audiobook for the next one but I will keep looking. Where does Peak Season rank among all the audiobooks you’ve listened to so far? Peak Season is a wonderfully mysterious novel! The protagonist, CW McCoy, is a strong female lead who is both clever and strong willed. Very skillfully written; the characters are described in such detail that they feel real and relatable. The scenes are intricate, suspenseful, and haunting. This book has everything; mystery, romance, suspense, and murder! Overall, Peak Season was a very engaging read and I cannot wait to start the next novel. I am a avid fan of good mystery, with a bit of thriller tossed in. The author did a great job with the plot. Not a bad listen during a snow storm. I would like to see a follow up book. I will be on the look out. 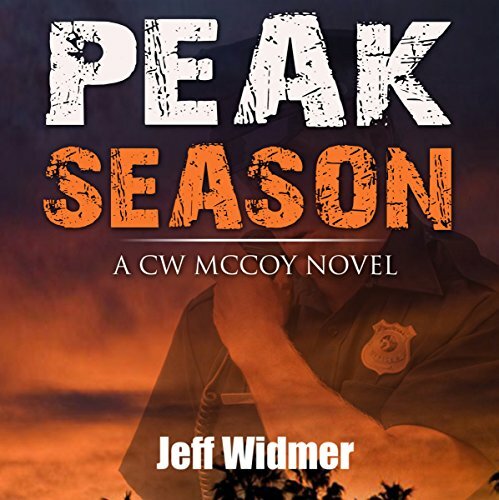 Peak Season introduces Candace CW McCoy, an ex-cop, who gave up her job after she was forced to shoot a fellow policeman. She now lives with her grandfather "Pap" and is selling real estate in the tourist mecca of South Florida. Accused of stealing millions from his investors, Bobby Lee Darby was presumed dead until he appears in CW's office demanding she prove his innocence. When CW declines, he kidnaps Pap forcing her into action. Aided and supported by a great cast of characters from her widowed friend Walter and his dog, to Oz, the nerdy but pretty hot IT guy, CW sets out to uncover the mystery of the missing money and to find her grandfather who requires constant care. As bodies start turning up, the local detective also starts showing an interest in CW and her involvement in the case. Peak Season was a thoroughly entertaining cozy mystery with a likable protagonist who loves motorcycles, country music and has several potential love interests. She was an excellent character helping out an old lady who was feeding the Florida wildlife as well as her neighbor, a single Mum and cop who was having problems with her ex-husband. My only minor criticism, I found it hard to believe how calm and collected CW remained after her ailing grandfather was kidnapped, setting time aside to go out, have drinks and carry on with all sorts of other things. She was a bit too leisurely and laid-back considering the circumstances. The author's descriptions and insights into the South West Florida setting were really interesting and provided another, completely different side to the book. Overall, a really good mystery that kept you guessing to the end interlaced with humor and sharp dialog. The narration by Pamela Almand was excellent. She was a really good fit for the character of CW, and I was very impressed by her distinct and very authentic male voices. She had a great range of different voices and provided a clear and lively narration that was superb fun to listen to. There were no issues with the production. All in all, a great start to what promises to be an interesting, fun series, and I look forward to finding out what Jeff Widmer has in store for CW in the future. What Would You Do To Save A Loved One? CW McCoy is an accomplished law-enforcement police officer. But after she shoots another officer, she turns everything in and moves to Florida, where her elderly grandfather lives. Soon after she arrives, her grandfather is kidnapped. CW's is 'back' and all her vows she made about steering clear of anything to do with law enforcement again as she tries to hunt down his kidnapper. This book reminded me of a book I read years ago. I had to look it up and it is Fallen by Karen Slaughter. A somewhat similar plot (but very, very different writing). When I was done and reflecting on what to write for this review I thought of another author whose characters bicker and just in a similar way. That would be Janet Evanovich and the Stephanie Plum series characters. I am not insinuating AT ALL that this is a knock off. It is very well-written, in a unique style and when I compare this book to those great authors, I mean it as a high compliment. Pamela Almand performs Peak Season in the authors style. A very good performance – both are really good and deserve good too high praise. Movie rating? PG-13 because of the language at times, but overall there isn't too much to warn about. *I listen and review many authors/narrators in exchange for my review, including this one. Some are incredibly awful, some fair, some good and some right out of the park. You will see this reflected in my reviews. I would rate Peak Season, a book I listen to in exchange for my review, as good. I enjoy leaving reviews, as I know that I read them the reviews of others before I purchase a book. If you found my review helpful in your decision about this book, would you please select yes directly below this paragraph? Thank you so much. Set in Florida, Candace McCoy works in real estate. She used to be a cop but gave it up after an unfortunate and intense situation. Then Bobby Lee Darby turns up on her doorstop. He was presumed dead after being involved in a money scam. He was hunted by the FBI and several unhappy investors. Now he insists that he’s innocent, someone else made off with that money, and he wants McCoy to look into it. She refuses until her grandfather, Pap, turns up missing. Darby is playing for keeps and McCoy is royally ticked off. For the most part, I really enjoyed this story. The one aspect I didn’t care for was how nearly every male would make lewd comments towards McCoy, even her friend Walter. Some of the comments are just a bit flirtatious but others are way over the line. Not all men act like this, so why have them all do so (with the exception of Pap) in this story? The mystery is pretty good. There’s plenty of suspects since the missing money is in the millions. Darby has a wife, two kids, a former business partner, and plenty of investors that want answers from him and their money back. Someone thinks McCoy has a key piece of info and her office and house get ransacked. Yet McCoy doesn’t know what it could be. I totally thought the culprit was this one person and the plot showed me I was wrong. As the clues rush together, the suspense builds and builds. McCoy has to rush at the end to solve the mystery and keep the innocent safe. I like the 2 minor side plots as well. McCoy is still wrestling with her final action as a cop and she hasn’t wanted to carry a weapon since then. Also, her good friend and neighbor (who is still on the force) has an abusive ex-husband. Both ladies have to face off with this brute. All together, it held my attention the entire time. 4.5/5 stars. The Narration: Pamela Almand makes a great Candace McCoy. She’s got the tough cop swagger that goes well with righteous confidence. Her male voices are believable. Almand has distinct voices for all characters and there were no technical issues with this recording. 5/5 stars. Would you listen to Peak Season again? Why? Yes. I liked the way that McCoy was drawn into something that she wasn't really wanting to be involved in following her personal trauma. I think another listen will get me even more insight into her character and the story. I also think she will develop nicely in a series as a strong main character. What was one of the most memorable moments of Peak Season? I visited Florida as a child. As a tourist. I love the description and exploration of it. Which character – as performed by Pamela Almand – was your favourite? McCoy. A sleuth that is both interesting and full of promise! Even paradise needs a detective.